This lovely apartment is a perfect small family getaway. As a family with 4 children we know the importance of holiday accommodation that allows everyone to enjoy their time. We will do our best to make sure parents can have a well deserved break (even offering babysitting if we are home) and that the children to have activities and friends to connect with also. The apartment is freshly decorated with a simple elegance that adds to the peace & tranquility offered by its coastal surrounding, bring the children and let them explore. Boasting all the mod cons. 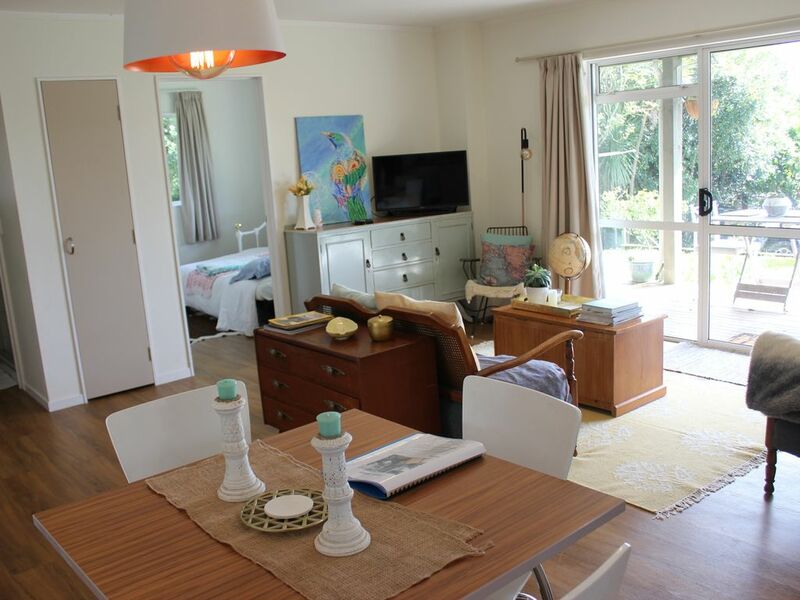 Smart TV, Sky, Unlimited fast VDSL, it has everything you could possibly need for a lovely break and all just a stones throw away are lovely beach walks, parks, renown cafes, restaurants, matakana cinema and markets as well as other well know local attractions. The two bedrooms both have queen sized beds and an additional single mattress in the second room. A portacot at your disposal that can fit in the main bedroom. The bathroom has one shower, kitchen is well equipped. This downstairs apartment has its own entrance and own deck. The apartment is fully self contained with full kitchen, bathroom and laundry facilities. We love company and will be more than glad to connect with you as you stay in our flat. We are a family of 6 living upstairs and you will definitely hear some noises between 7:30 am and 7pm. Our kids are very respectful and go to bed at 7pm most nights which will provide you with a peaceful environment at night. But you can always feel free to walk up the driveway and knock on our door for some company or simply to ask us anything you need. If the children are too noisy with their play upstairs, simply text us or come and fetch us. We are happy to ask them to be quieter for your convenience. But if you have children, we are more than happy to provide endless play dates and even if needs be, we can arrange baby sitting with enough notice. Our flat is situated in front of or garage, so we will at time have access to the garage. With enough notice and if your prefer we can make sure we do not come by to respect your privacy during your stay. But if you don’t mention it, we will use the freedom to come in and out of the garage at time. Our children sometime might want to play in the garage. So likewise we will need some notice if you prefer complete privacy, as we can warn the children and will let them know your preferences. We are a kiwi / french / american family who have been living here in Tauranga with our 4 kids for the last 10 years. We love creativity, hospitality, healthy living and celebrating all kinds of diverse cultures. There is a shower, toiler, sink and a washer. A dryer can be made available with enough notice in our garage. jJust a stones throw away are lovely beach walks, great parks, renown cafes, restaurants & markets as well as other well know local attractions. We have a common space in the large garage - full of toys that is used by our own children, simply ask if you want access to it for your children. ask if you want access to it. Perfect for what we were after. Thanks. Great place and location. As described, well kitted out and clean. Found a peach tree near garage with ripe fruit, yum! Unfortunately, broke a little vase looking for the light switch. A little light for late arrivers would be great. Communication was great from the owners. Accommodation was well suited to our needs. The spa is definitely a bonus!